While the legal definition for “freedom of speech” varies by society, there are two primary components that are common to most conceptions of the idea. First, free speech is the right to say things that are intensely offensive, crude, or unpopular, without the fear that the government will try to censor you or punish you for your speech. Second, it is the right to speak in a society without fear that your speech will result in others trying to harm you. Obviously, there are caveats to both of these ideals that provide some nuance. For example: some types of speech are not without consequence from the government (ex. endangering people by yelling fire in a crowded theater); additionally, individuals may not physically harm in retaliation for your speech, but they can freely use their own speech to attack you and can punish you if you are in an economic arrangement with them (ex. firing a news anchor for saying offensive things). The Charlie Hebdo terrorist attack was a direct attack on free speech, where private individuals decided to kill people who offended them with their speech—this represents a violation of the second type of free speech mentioned above. The brutality of this attack has mobilized populations and governments alike, stirring up popular support for the magazine and a desire to punish those who are seen as a threat to free speech. During the last week, France has arrested 54 people for “offensive speech” that supports the terrorists who committed the Charlie Hebdo attack or terrorism in general. Some of these individuals are now facing charges of inciting terrorism and could spend up to 7 years in jail. In addition to punishing those who voice support for terrorism, there has been a crackdown on hate speech, particularly by members of the Muslim community. These arrests represent a dire threat to free speech and a start down a very dark road. If the government starts punishing people for simply saying something unpopular, free speech is chilled exactly as though the threat came from religious extremists wielding guns—in both cases, the speaker faces retaliation for speaking their mind, even when that speech poses no threat to society. If you support free speech, you must do so even when the speech is ridiculous and offensive to you personally. Everybody has the right to speak their mind in a free society and the proper responses to hate speech and offensive ideas are even more free speech and social pressure, not the threat of physical or legal force. 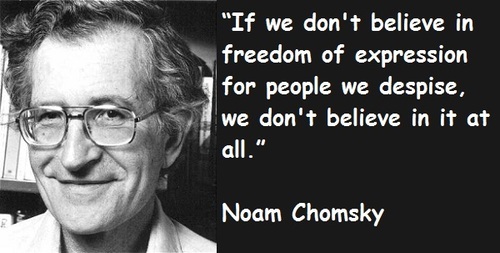 Besides, everybody holds beliefs that are offensive to some group of people and, if you don’t support the current minority’s right to speak freely, you may one day be on the wrong end of public opinion and face consequences yourself. A quote often attributed to Voltaire perfectly summarizes this situation. He argued that “I do not agree with what you have to say, but I’ll defend to the death your right to say it.” This sentiment is why the ACLU supported the rights of the KKK to openly march and proclaim their hatred as well as the Westborough Baptist Church to spew their venom randomly at the innumerable groups they despise. The individuals who are arrested for exercising their free speech in France should be released and the government should stop its crackdown on unpopular ideas. 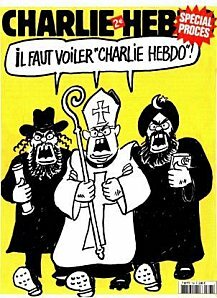 Bigots and extremists have as much right to speak as the writers of Charlie Hebdo and, if they say something offensive, it is up to us to either ignore them or engage them using our own speech. If people truly want to honor the victims at Charlie Hebdo and the values of a free society, they must support the principal of free speech, not just specific instances where it is convenient. It is very easy to criticize the violent extremists who kill cartoonists, but far harder to stand on principal and support the right of those who idolize these extremists to voice their admiration.